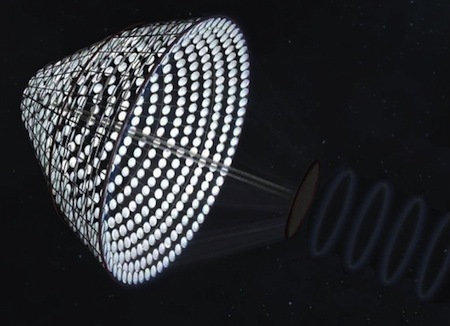 The Solar Power Satellite via Arbitrarily Large Phased Array (SPS-Alpha) has just been given seed money by NASA. The SPS-ALPHA is an idea from NASA engineer John Mankins, now with Artemis Innovation Management Solutions, for an Earth-orbiting satellite to collect solar energy and then beam it down to the surface of our planet. SPS-ALPHA (Solar Power Satellite via Arbitrarily Large Phased Array) is a novel, bio-mimetic approach to the challenge of space solar power. If successful, this project will make possible the construction of huge platforms from tens of thousands of small elements that can deliver remotely and affordably 10s to 1000s of megawatts using wireless power transmission to markets on Earth and missions in space. The selected NIAC project will enlist the support of a world-class international team to determine the conceptual feasiblity of the SPS-ALPHA by means of integrated systems analyses, supported by selected "proof-of-concept" technology experiments. The "bio-mimetic" approach is to build leaves out of an array of small mirrors, thus utilizing nature's proven method of solar energy gathering. Fans of sf great Clifford Simak will recall the solar energy beam from his 1941 story Masquerade. Echoing the concerns of modern-day critics of this idea, Simak referred to the difficulties of making sure that the energy beam didn't go astray!